Custom made with 100% money back guarantee. When is the last time someone competed to win your business? At 99designs you will have dozens of graphic designers compete to create the perfect logo, website, brochure, or business card. You pick the price, you pick the best, you save time and money. Use a custom 99design coupon code to save on your next design. Business is always best when there is competition. 99Designs has dozens of graphic designers competing to create you the perfect logo, website, brochure, or business card. Time is money, so do yourself a favor, and use 99Designs because you pick both the price and the best design. In fact, we know money is so precious, use a 99Designs coupon code to save you money with your design purchase. Below are instructions on how to use a 99Designs coupon code. After locating the 99Designs coupon or deal you want to use, click the corresponding "Get Deal" button on the Couponpal Website. A new window will pop open when you click on your button. If Couponpal is providing you with a 99Designs coupon code, copy and paste from the pop up window. Keep this window open in case you need to come back to it later. 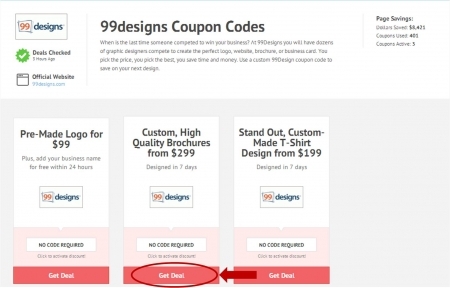 If there is no 99Designs coupon code, you will skip this step. Step 1 is to decide what you want designed. Choose from a logo, website & app, business & advertising, packaging & label, clothing & merchandise, art & illustration, book & magazine, or other. Under each category is a sub category. When you place your mouse over the subcategory, the starting price for the project will appear. Click the sub category project you want designed. Step 2 is to describe the design project. Provide information such as the name you want in the logo, a slogan you want incorporated in your logo, what your organization does, and who you target. Click "Next" to continue. Step 3 is to pick the contest details. 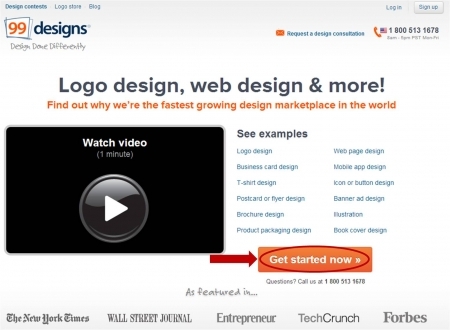 Select a design package. The design package details such as price and the estimated number of entries you will receive for each package are listed. Click "Next" to continue. The final step is to pay & launch. If you are a returning 99Designs customer, login. If you are a new 99Designs customer, fill in your credit card details, billing details, contact details, and referral details. Click "Pay & Launch Contest" to finalize your 99Designs contest. In the old days if a company or organization wanted a new logo it usually meant enlisting the high priced services of an advertising agency. 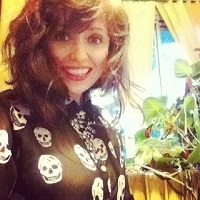 Now with 99designs it is possible to use the magic of outsourcing to connect with independent artists around the world. You start by filling out a simple request and specifying how much you want to spend. For seven days graphic designers compete by submitting ideas for your proposal. At the end of the week you choose the winning design. They get the prize money and you walk away with a spiffy new logo that is just what you wanted. It is not just for logos, you can launch a contest for any manner of individually customized websites and apps, clothing and merchandise, art and illustration, business advertising, books and magazines, packaging and labels, or anything else you can think of. On the other hand designers and artists can visit 99designs.com to browse through the different contests. They can communicate with the prospective clientele by using ratings, comments, and private messages while they work on a proposal. At the end of the week they may be the winner of a bronze, silver, or gold level design contest and have a fabulous new reference for their portfolio. 99designs was founded in 2008 by three Australian entrepreneurs living in Melbourne, Mark Harbottle, Lachlan Donald, and Paul Annesley. The ease of obtaining attractive new designs appealed to local business owners across the globe. In 2010, they opened a new headquarters in San Francisco and won the influential Webby People's Voice Award for Best Web Service and Application. Their European HQ was built in Berlin during 2012 after they acquired a similar website called 12designer. Since then they have made their services available in German, French, Spanish, Dutch, and Italian, as well as English. Not-for-profit organizations have the option to apply for designs through 99nonprofits. Every year 99 charity organizations are selected to receive 99designs services at no cost. The winning designers receive their prize money out of 99designs’ pocket. To honor their achievement the victorious artists are also featured on the 99designs website. You may have 99 problems but finding the perfect original artwork does not have to be one of them anymore. 99designs is an exciting, modern approach to a once costly creative needs for business. Launch a design contest that will interest professionally trained artists everywhere that there is Wi-Fi. Start it up right with a 99designs coupon code to get discounts on your purchases.